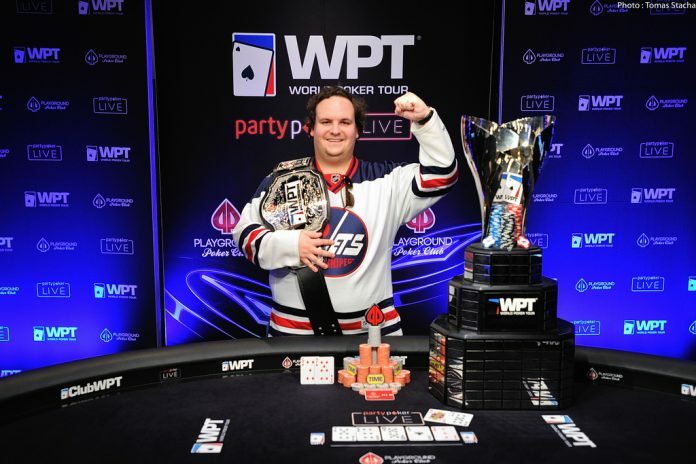 The World Poker Tour has a new champion, after Patrick ‘prepprepprep’ Serda defeated a field of 792 entries to win the Season XVII WPT Montreal C$5,300 Main Event. Serda came into the final table at Playground Poker Club with the chip lead and successfully battled his way to victory to claim the C$855,000 first-place prize. At the official WPT final table of six, Serda defeated World Poker Tour champion Ema Zajmovic in heads-up play, and he also battled with Sorel Mizzi (3rd place) and WPTDeepStacks champion Upeshka De Silva (5th place). *First-place payout includes a $15,000 entry into the season-ending WPT Tournament of Champions. The final-table eliminations began when Jiachen Gong was sent home in sixth place as the result of a three-way clash. Zajmovic, Gong, and Kauvsegan Ehamparam found all of the money in the middle preflop. Zajmovic and Gong both had ace-queen, and Ehamparam had ace-king. The ace-king held for Ehamparam and he won the pot to triple up, while Gong long to Zajmovic after she made a flush. De Silva was next to go, busting at the hands of Mizzi when his pocket fours couldn’t pull off the upset against Mizzi’s pocket jacks. Shortly after that, Ehamparam was sent home in fourth place by Zajmovic. Three-handed play meant Zajmovic was just two players away from her second World Poker Tour title. Serda and Mizzi were each looking for their first. After being fairly quiet throughout the final table, Serda woke up in a big way when he knocked out Mizzi in third place. Mizzi had fallen short and moved all in from the button for 3.2 million when the blinds were 100,000-200,000 with a 200,000 big blind ante. Serda reraised all in from the small blind for 12.6 million. Zajmovic folded from the big blind and it was Mizzi’s two sizes against the pocket nines for Serda. Mizzi failed to come from behind and was knocked out in third place for C$410,000. With the elimination of Mizzi, Serda was able to enter heads-up play with a slight lead. Serda had 16.15 million to Zajmovic’s 15.675 million. Only a handful of hands were played between the two before Serda sealed the victory. The heads-up pots played between Serda and Zajmovic to start didn’t seem like much. Then, seemingly out of nowhere, the two collided to end the tournament. On the final hand, Zajmovic raised to 500,000 on the button. The blinds were still 100,000-200,000 with a 200,000 big blind ante, and Serda opted to three-bet to 1.6 million. Zajmovic came back with a four-bet to 3.8 million, and Serda called. The flop was and both players checked to see the land on the turn. Serda checked, Zajmovic bet 3 million, and Serda called to see the land on the river. Serda checked, Zajmovic moved all in for 8.5 million, and Serda went into the tank. He eventually made the call holding just the for a pair of sevens. Zajmovic had air with the and was eliminated in second place. Season XVII WPT Montreal event marked the first in the new four-year partnership between the World Poker Tour and partypoker LIVE. The event attracted 792 entries but failed to reach the C$5 million guarantee on the prize pool. The top 103 places reached the money, and notable finishes were had by WPT Champions Club members Jonathan Little (8th – C$105,500), Amir Babakhani (12th – C$67,000), Mike ‘goleafsgoeh’ Leah (18th – C$36,500), Marvin Rettenmaier (45th – C$14,978), David Ormsby (55th – C$13,221), Matt Salsberg (99th – C$8,712), and Darryll Fish (102nd – C$8,712). Next up for the World Poker Tour is the Season XVII WPT Seminole Rock ‘N’ Roll Poker Open at Seminole Hard Rock Hotel & Casino in Hollywood, Florida. The full festival runs November 14-28, 2018, with the $3,500 Championship Event taking place November 23-28. Photo courtesy of the World Poker Tour.